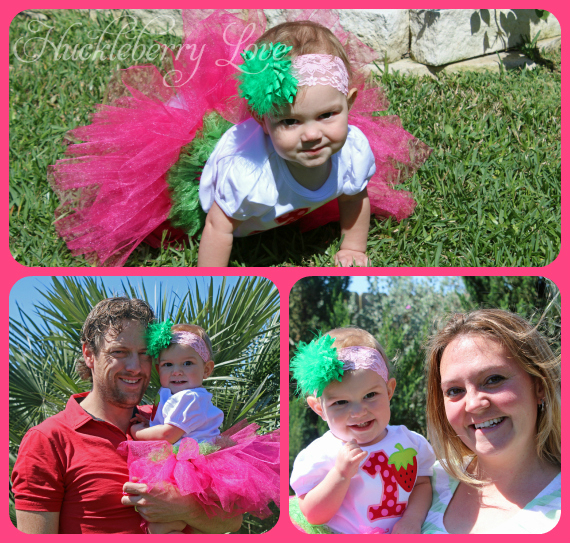 Huckleberry Love: 'Sensational Strawberries' First Birthday Party! 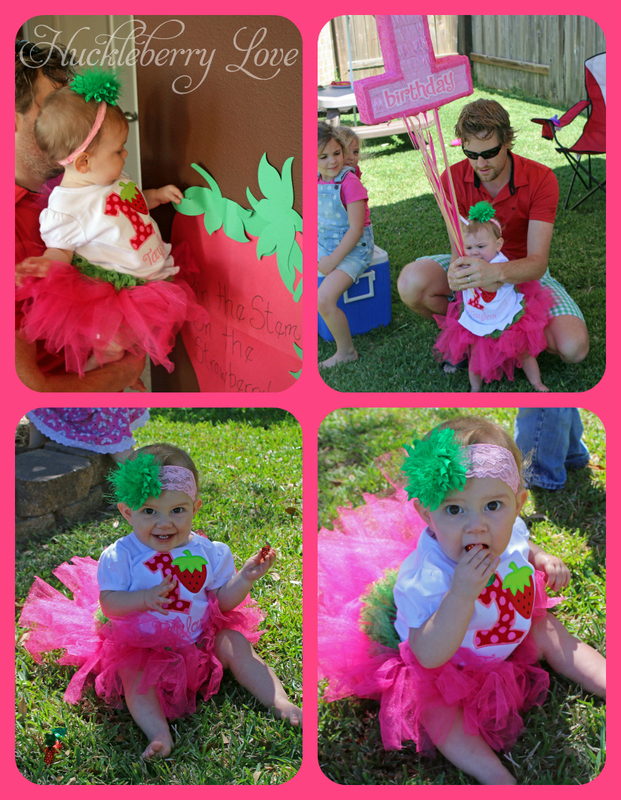 'Sensational Strawberries' First Birthday Party! 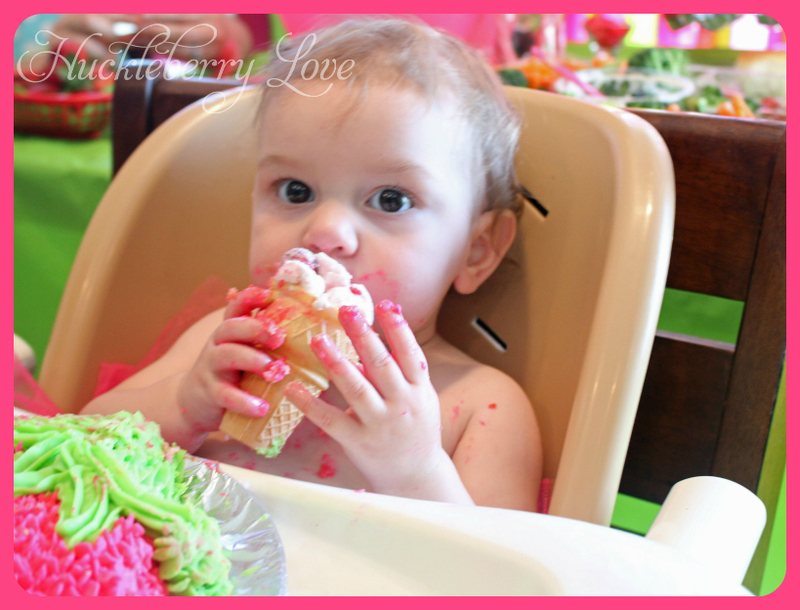 I can't believe my littlest just turned one. It saddens me how fast they grow, but it is so much fun to watch! The changes they go through in such a short span of time is fascinating. 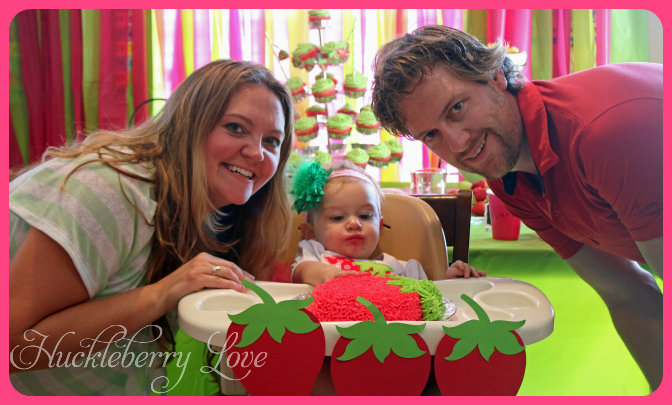 Anyway, I like to have themed parties for my girls so I decided to go with a Strawberry party for Taylor. They are probably her favourite fruit and are super cute so it was a no brainer. 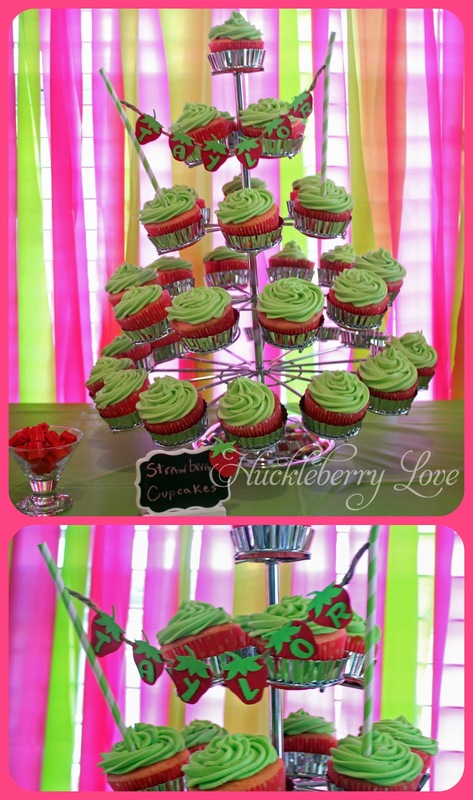 For party decor I chose a bright pink and lime green colour palette. 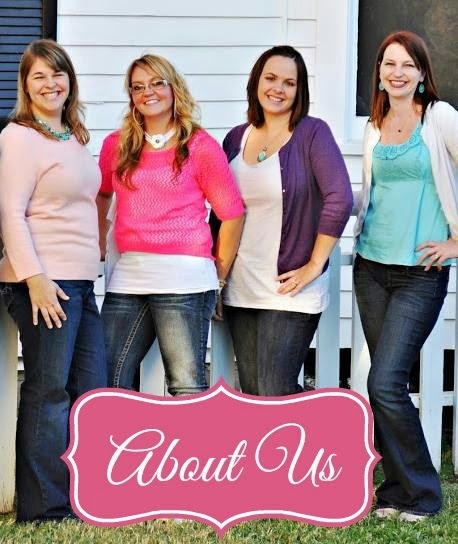 It just seemed younger and more girly then the traditional red and green. 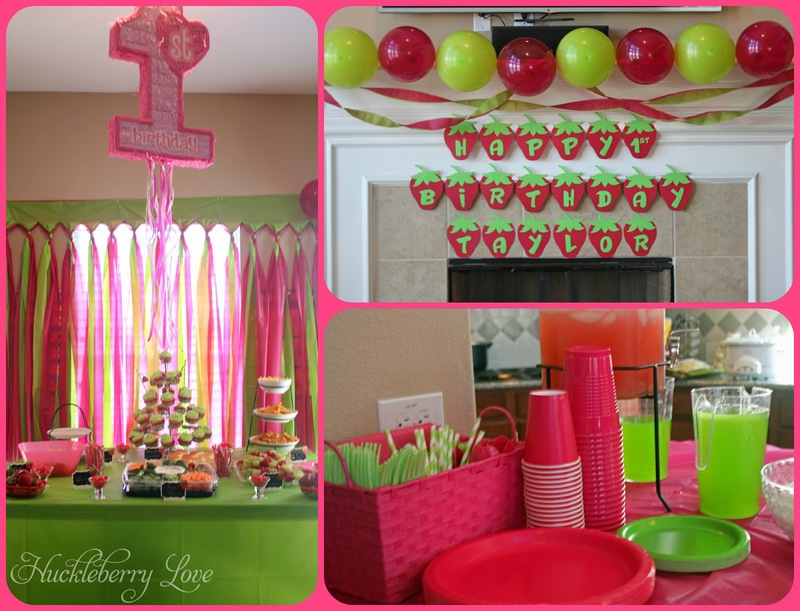 So, with a few colour coordinated balloons, streamers, tablecloths, dinnerware and a handmade Strawberry banner (of course) the Strawberry themed party came to life! 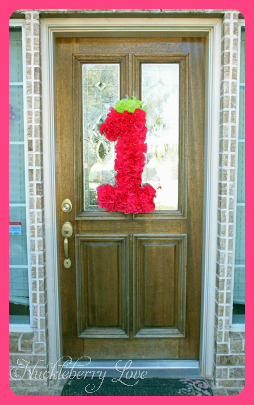 I even made a tissue paper #1 for the front door. Check back later for a full tutorial on how you can make your own. They make a great wall hanging for a childs room too. 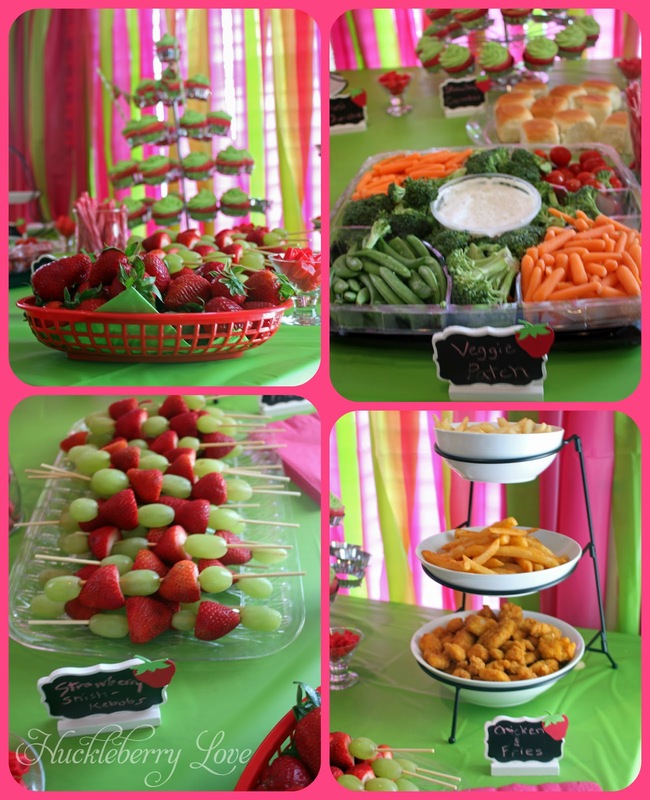 Parties are never a party without some munchies so besides having a boatload of strawberries to munch on, we also had a veggie patch (veggie tray), strawberry and grape shish-kebobs, chips and queso, popcorn chicken, fries and wings and a few strawberry flavoured candies. 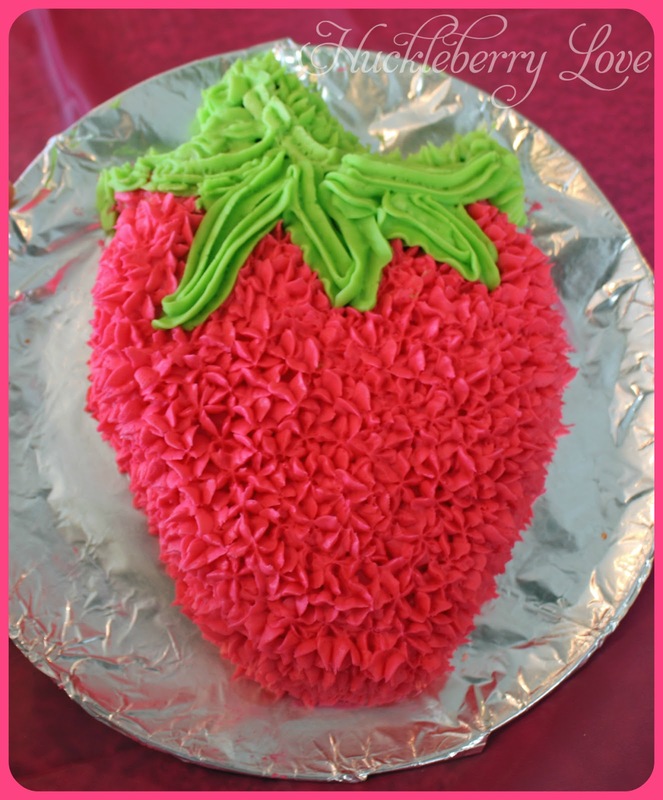 For dessert I made strawberry cupcakes for the party attendees and a strawberry smash cake for the birthday girl. A lot of Taylor's party guests were a bit older than her so we had to have some games to play. 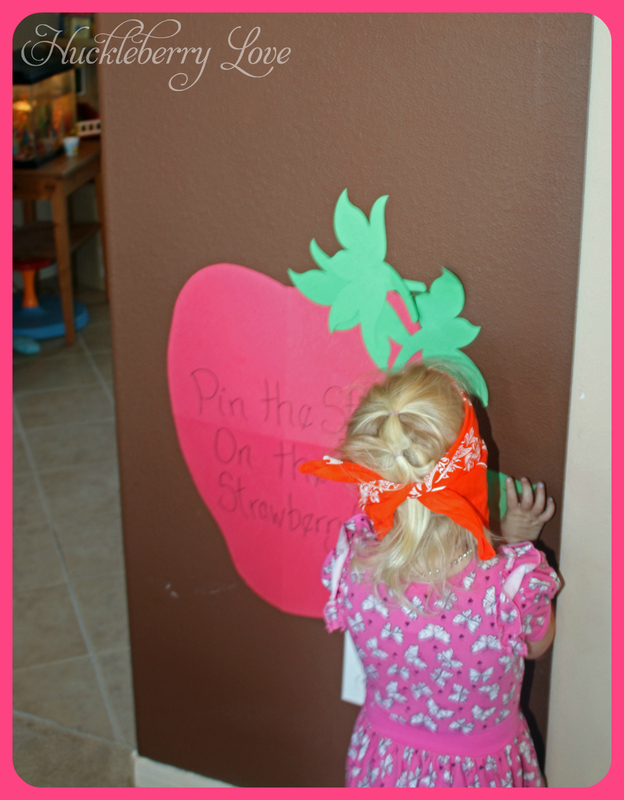 Pin the Tail on the Donkey is always a hit with the kids so I made up a Pin the Stem on the Strawberry game. 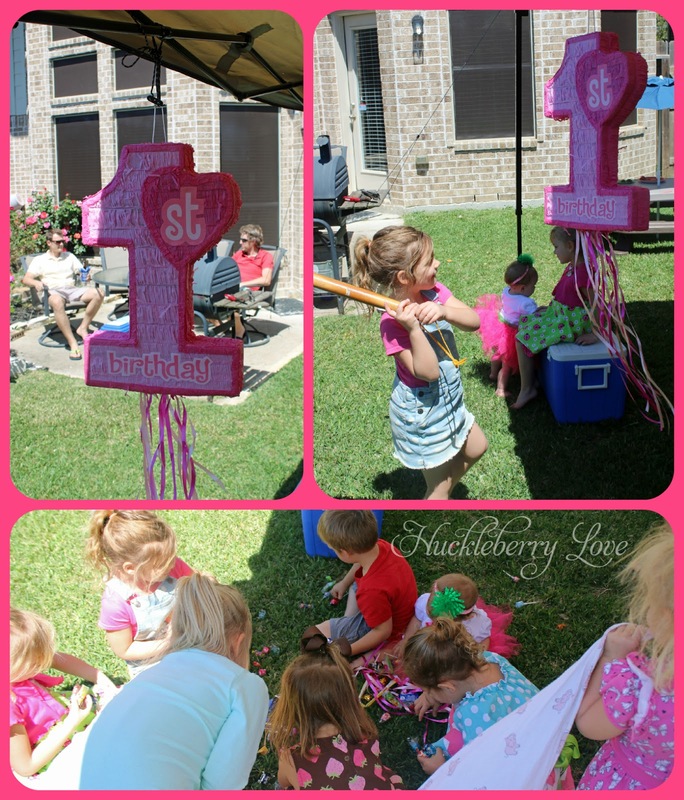 I wanted to have a pinata too, so even though I couldn't find a strawberry one and didn't have time to make one, I found a super cute #1 that worked perfectly. The last game we played was by far my favourite. While the kids were outside in the backyard playing, I went into the front yard and threw a bunch of Brach's strawberry filled hard candies everywhere. 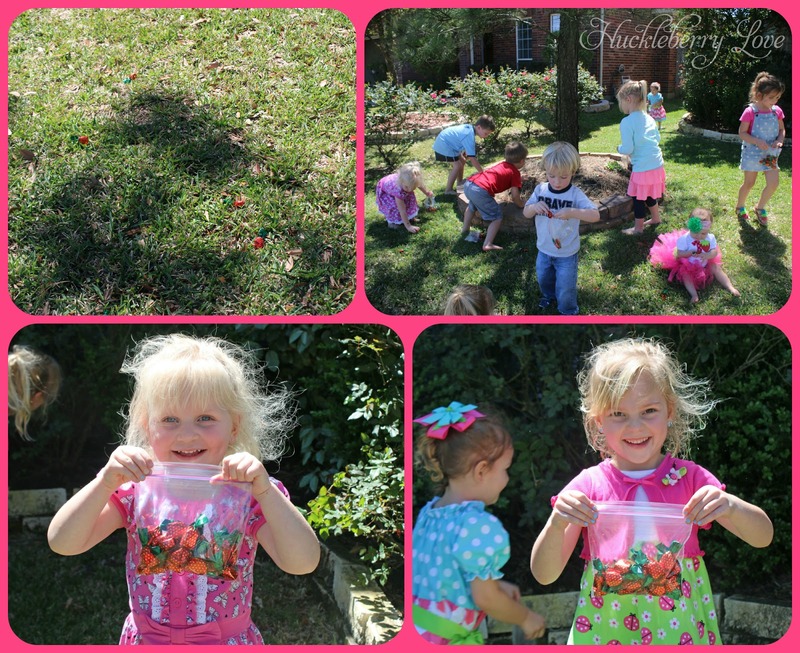 I then told the kids that a strawberry patch had grown up in the front yard and we needed help gathering all of the strawberries. Then we let the kids loose out front for a strawberry picking free for all. (It was basically like an Easter egg hunt). The kids loved it!! All of the games were a huge hit and even though she is only one, we found a way to include Taylor in all of them. We always like to send our guests home with a little treat to say thank you, so in sticking with the strawberry theme, I made chocolate covered strawberries for all of our attendees. Yummy!! 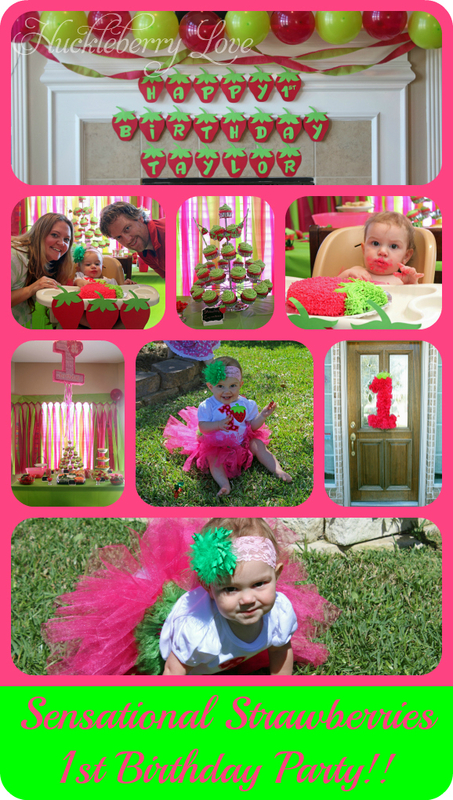 All in all the party was a huge success and even though she couldn't exactly tell me herself, I know she had an absolute blast! !